Addres : GD Ambedkar Road, Lalbaug (central Mumbai). This is one of the most popular Ganesh Mandals in Mumbai and attracts nearly a million people during the 12-day celebrations and is also one of the rich Ganesh mandals in Mumbai. 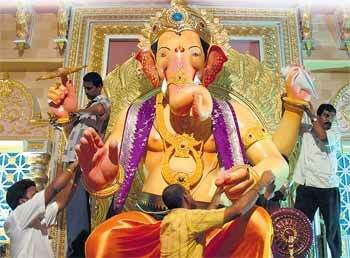 About five decades ago GSB in mumbai commenced the Annual Sarvajanik Ganeshotsav at the newly inaugarated Dwrakanath Bhavan Complex, at the junction of Tilak Road extension and Katrak road, near Dadar T.T.Gowd Saraswat Brahmin community Seva Mandal is popularly known as the Golden Ganesh in Mumbai. One of the most popular Ganesha Pandal in Mumbai, G S B Ganapati adorns jewellery of gold and silver worth 100 million rupees. This year, our Mandal will create a replica of the ancient Akshardham temple located at Gandhi Nagar, Gujarat. Like every year replica will be made by world famous, “Taj Mahal” fame, Art Director Mr. Anant Shinde “Azad Nagar Sarvajanik Utsav Samitee was established way back in the year 1966, 46 years ago, by the blue collared workers of golden Tobacco company, Tata Special Steel and Excel Industries Ltd, who moved from the Lalbaug. Parel bastion and settled in Andheri west, Azad Nagar M.H.B Colony, closer to their factories in which they worked. M.K. Menon, Tukaram Salaskar, Vasudev Kasalkar, etc. were the founder members who started this Ganeshotsav. Girgaoncha Raja is organized by the 84-year-old Nikadvari Lane Sarvajanik Ganesh Mandal. They always opt for an eco-friendly Ganpati idol and is usually more than 20 feet tall. Girgaoncha Raja is located near Charni road railway station. Established in 1928, Lalbaug Sarvajanik Utsav mandal at Ganeshgalli is noted for its decorations and also has history associated with it.Everyone in the area as well as those associated with LSUM were proud to have “Mumbai Cha Raja” award. All people had one voice & wanted to keep this name “Mumbai Cha Raja” as a permanent tag for Ganesh Galli’s Ganesh idol. Sarvajanik Shree Ganeshotsav Mandal, Khambata Lane at Khetwadi was established in 1970. In 2011, a 28-feet tall Bal Ganesh standing on an elephant’s trunk on three toes will be a major attraction at this Mandal.Sarvajanik Shree Ganeshotsav Mandal, Khetwadi, Khambata Lane was established in the year 1970. At that time, Mandal’s founders like Late Balkrushna Gandhi, Late Balkrushna Bedekar, Late Harishchandra Zagde, Late Rajaram Takakar and Late Ramchandra Sawant had contributed valuable suggestions and help for growing our Mandal. Late Ramchandra B. Aagaskar was successfully handled the Mandal for 23 years as a Chairman. Khattar gali mandal at Girgaon was established in 1965. The mandal uses Ganesh Chaturthi to create social awareness. The festival at Keshavji Naik chawl ganesh mandal is more than 100 years old and was started in 1893. The mandal is noted for its small Ganesh idol and eco-friendly celebrations. This Mandal is popular for promoting eco-friendly Ganesha. This is the 23rd year of celebration.Bal Gopal Mitra Mandal was established in 1989 with the cultural vision of celebrating the Ganesh festival. In the beginning two boys sold all their old news papers to buy an idol worth Rs. 8 from the Vile Parle market that was for one and a half day and now that small plant had turned in to big and a strong tree. Our ganesh mandal had introduced the historical changes in the making of Sarvajanik Ganesh Idol. As a result of this our Mandal is one of the most famous and a part of the top ten ganesh mandal in Mumbai. The highlight in 2012 of this Mandal is the replica of Akshardham Temple in Delhi.